Do You Care About Propitiation? Jesus Himself is the sacrifice that satisfies God’s righteous wrath against our sins. Jesus Himself took our punishment for sin on the cross, where the great exchange happened: Jesus took our sins, and gave us His righteousness (2 Cor. 5:21). If you are in Christ, you no longer have to fear the wrath of God, because Jesus already bore it. Jesus is your propitiation (notice the present tense in 1 John 2:2). This idea of turning somebody favorably towards God because of a worthy sacrifice is beautifully illustrated in the Old Testament. A form of the word “propitiation” was used in the Greek translation of the Old Testament to talk about the Mercy Seat on the Ark of the Covenant. God’s presence, the Shekinah Glory, was above the Mercy Seat, and underneath the Mercy Seat–inside the Ark–was God’s Law. The sprinkled blood on the Mercy Seat on the Day of Atonement went between God and His broken law. It appeased or satisfied God’s righteous wrath against sin and a sinful people. Jesus, the Lamb of God, was the fulfillment of this picture, the final atoning sacrifice for our sins. 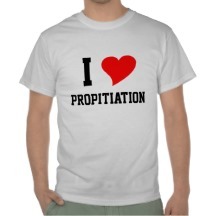 So, do you care about propitiation? You should, because you and I need it. We need “a sacrifice that bears God’s wrath to the end and in so doing changes God’s wrath toward us into favor” (Wayne Grudem, Systematic Theology, p. 575). When you sin today, ask Christ to forgive your sin (1 John 1:9), and then praise Him that He is the atoning sacrifice that satisfies God’s wrath against your sin.